The rainy season is upon us and some of your recently planted trees are leaning over due to really wet dirt or maybe strong winds (or a combination of both). The tree needs to be supported so it can grow straight up, unlike the one above. In the past many have used wire to do the job. It is easy to work with and we usually have some laying around the house. While this is a quick fix, the tree won’t like it. Over time the wire will cut through the bark and in to the tree and then nutrients have no way to travel past, really damaging the tree. Arborists tell us to provide padding wherever we support a tree. Wire passed through garden hose has been used or a couple of pieces of wood between the wire and the tree will also work. A simpler way is to use a web strap. 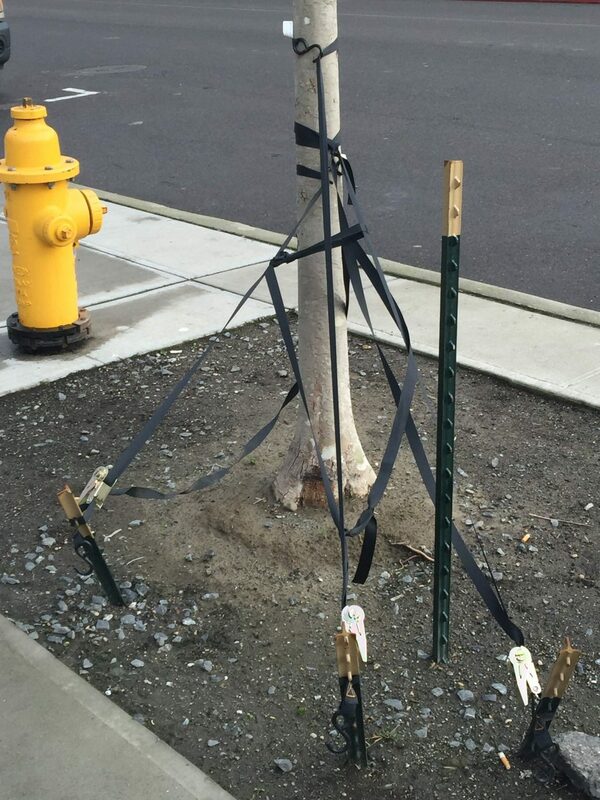 Here we have a tree planted in a sidewalk cut out that has been staked using three ratchet straps. This allowed the tension on each strap to be easily and quickly set and adjusted if needed. The way the webbing was attached to the tree is better than a single piece of wire but would not be good in the long term. 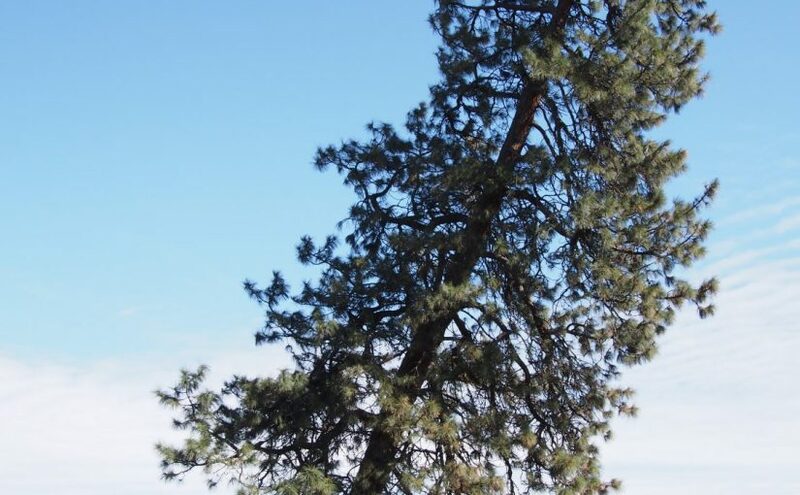 The National Forest Service does not allow tree attachment points for backcountry horse pickets or even hammock suspension to damage the bark. The minimum with webbing used to comply with this requirement is 2″ and that would be a good place for the homeowner to start. A simple endless sling will protect your investment and provide a safe place (as far as your tree is concerned) to attach a rope, wire, ratchet strap or whatever you plan on using to get your tension. You could also use a single loop strap but this would require tying a knot in the webbing where you plan on attaching your tensioning device. We could also make you a strap with a loop in each end which would really be the best alternative. This way it could just go around the tree and not “choke” it. It would need to be placed above a limb so that it wouldn’t move down the tree as it sways in the wind.